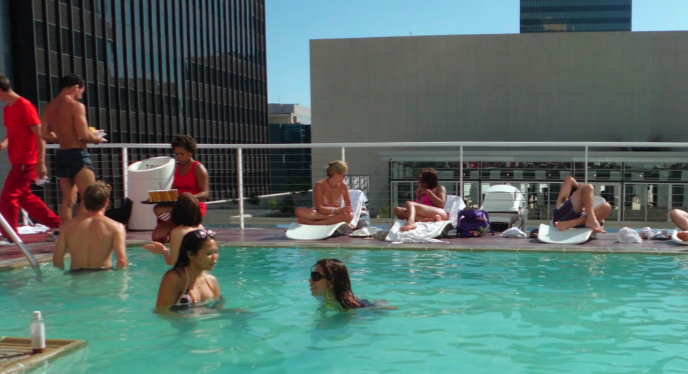 I’ll bet you didn’t know that the pool at The Los Angeles Downtown Standard hotel is open to the public. Yep, anyone can show up, goggles at the ready, floaties in hand and flip-flop through the lobby, to the elevator bank and up the 12th floor. From there you can either take another elevator up one more flight, or you can walk up the stairs and out onto the roof deck and swanky pool area. 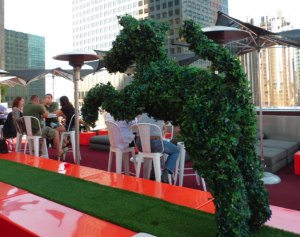 It’s an urban oasis with bright colors and astro turf everywhere. 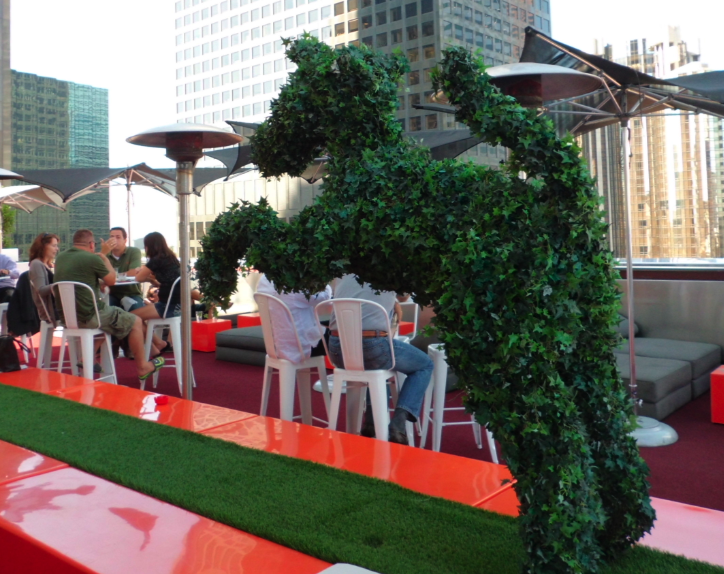 They’ve got topiary dogs lining the bar area; an outdoor fireplace surrounded by comfy seating. 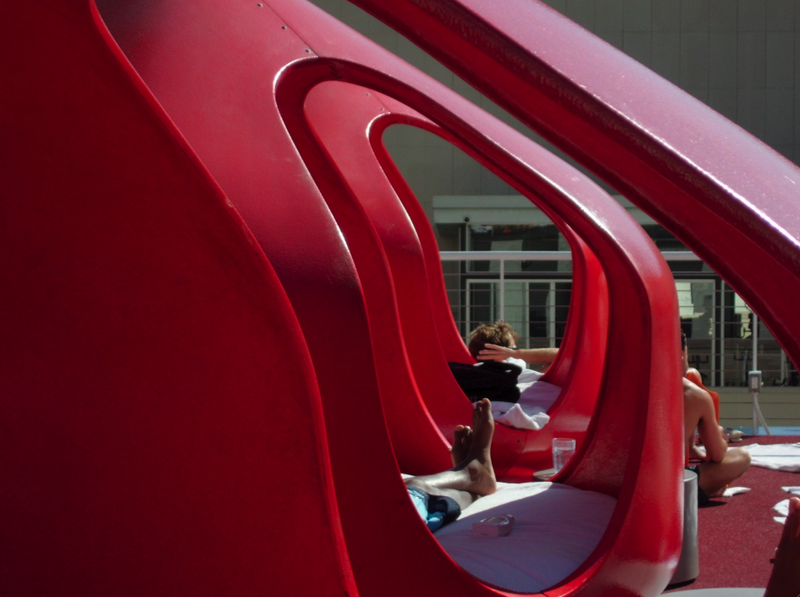 I had this image of myself reading my new Joan Didion book on those freeform modern white chaise lounges, lazing the afternoon away while my kids splashed happily in the infinity pool. Here’s what really happened: It’s a scene. 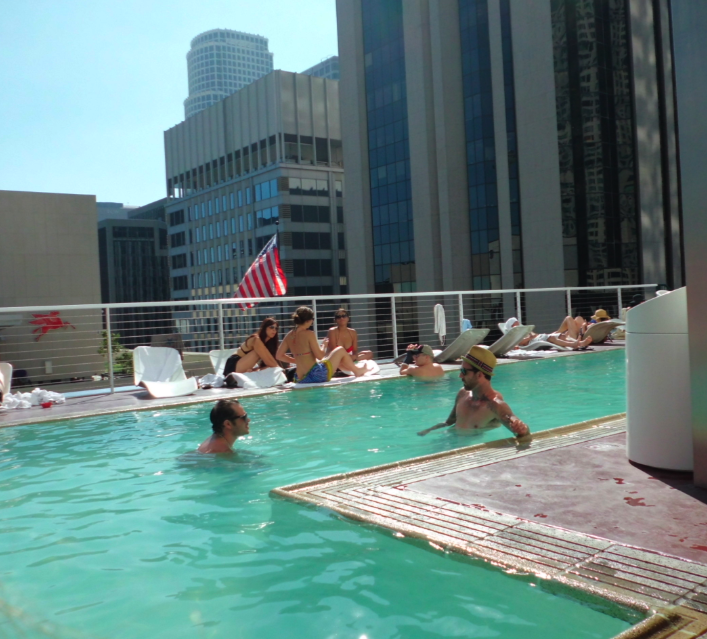 On a sweltering August Friday afternoon, every single white chaise, orange plastic chair and red cabana was filled with tattoos, creative facial hair, teeny tiny bikinis and hipsters clutching cocktails. The music was pumping, the cocktail waiters and waitresses were wearing out their sneakers. All of the ultra mod red plastic pods (which by they way are lined with vibrating waterbeds) were being used. A couple of kids and a 40-something mom in a big floppy hat don’t exactly blend into that scene. My 8-year-old got in the water and quickly forgot about everything around her but touching the bottom (it’s only 3 1/2 feet deep) and doing handstands. My about-to-start middle schooler could not have been less mortified than if I had asked him if he had to go pee-pee in the middle of a Little League game. At his age, going places where he doesn’t fit in is like putting needles into his eyes and them dousing them with Tabasco sauce. The hipster broth was just starting to boil and all he wanted to do was get the hell out of the crock pot. But the view of downtown is awesome. 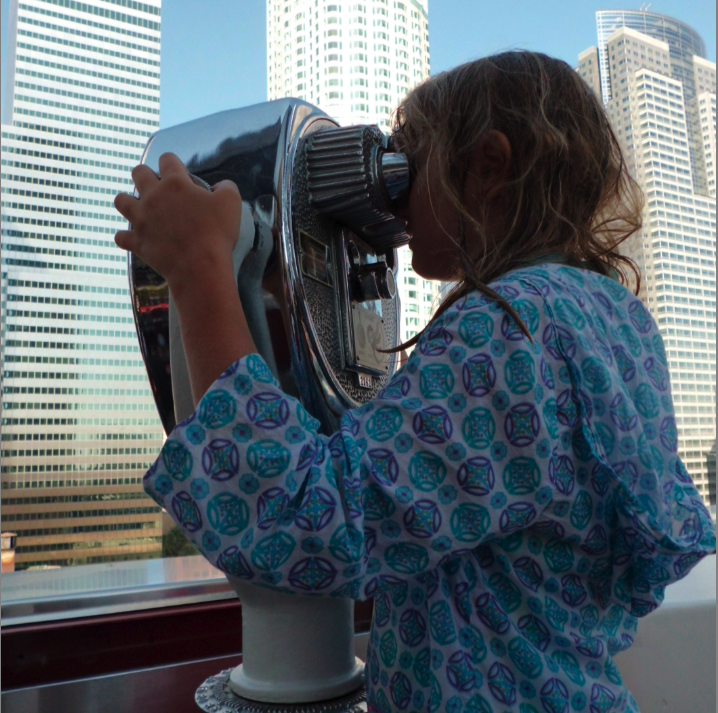 There are 25-cent telescopes, like on the top of the Empire State Building, for getting a closer view of the Hollywood Hills, the downtown skyline. 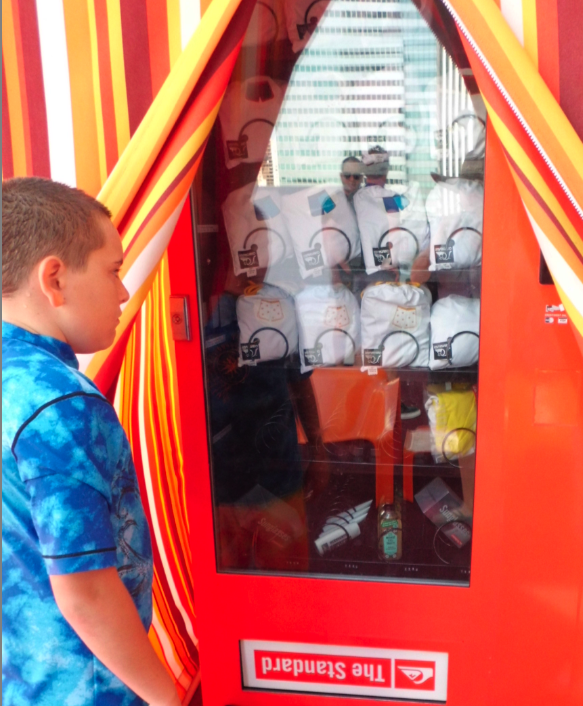 And we loved the vending machine: If you’re so cool that you’ve just flown in from the East Coast for a meeting at the studio but forgot your swim suit, you can buy one with the swipe of a card, along with sunglasses and sunscreen. If only they put straw fedoras and Pabst Blue Ribbon in there too, right? Our visit was short but we were there long enough to cool off in the pool, take some photos and scar Henry for life. Next time we’ll try a Monday or Tuesday, earlier in the day. I’m not giving up my chaise lounge dreams quite yet. Public hours are Monday through Friday from noon to midnight. 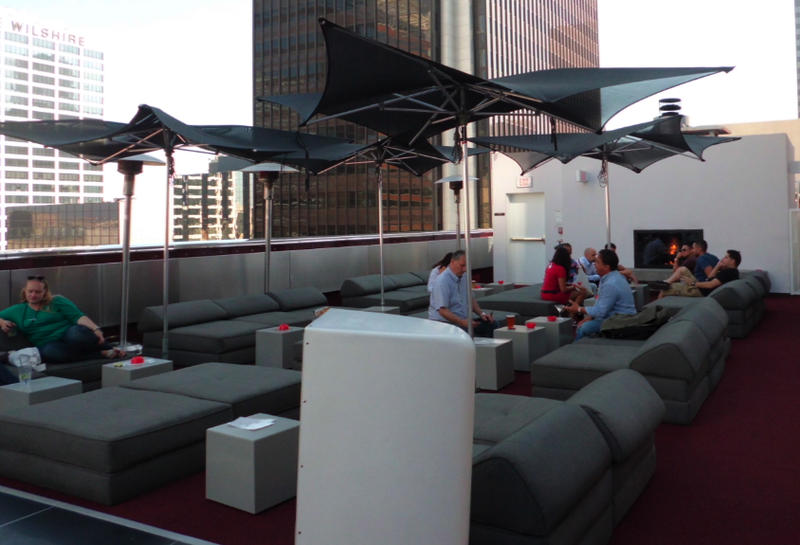 After 7pm guests need to be 21, and on weekends the pool and rooftop are used for private parties. Parking is pretty steep at the hotel. We found a $5 per-hour meter right out front. 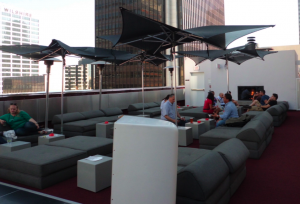 If you don’t mind walking, the lots at Pershing Square are often more affordable and there is always the Metro.